The local Washington, D.C. charity I am doing the triathlon to raise money for is the American Red Cross of the National Capitol Area (http://www.RedCrossNCA.org/). In choosing a charity I was hoping to find an organization that truly supports all people in times of need. I also wanted to choose a charity that had a strong military affiliation, having both served in the U.S. Navy and also known military friends that received assistance from the Red Cross. I plan on not only donating to the American Red Cross of the National Capitol Area but also becoming a volunteer and documenting my experiences on our blog. Smelly and I will be posting details and a link for donating shortly (once we figure out how to do it). We hope you can give your support! The local Cleveland, Ohio charity that I am doing the triathlon to raise money for is The Free Medical Clinic of Greater Cleveland a.k.a. 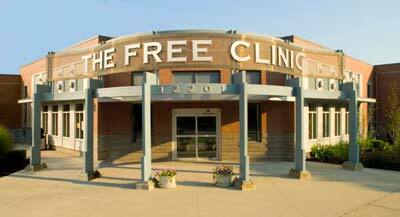 The Free Clinic (www.thefreeclinic.org/). I chose this charity for a number of reasons. First, my parents both volunteered at the Cleveland Free Clinic when they first moved to Cleveland Heights in the 1970’s (soon after the non-profit began and was being run out of an old house.) Second, I believe in its mission- in that everyone deserves healthcare no matter the age, race, socioeconomic status, whether you lost a job, can’t pay rent, are elderly and on a fixed income, if you are unable to pay the health insurance premium, and so forth. The Free Clinic believes that “access to healthcare is a right, not a privilege.” The Free Clinic strives to “provide quality health care and related services free of charge to those who lack appropriate alternatives, and to advocate for policy changes that make health care available to all.” I believe that this is important, especially because as we all know, America does not provide free healthcare for all of its citizens. It currently resides in University Circle and now provides services out of a 34,000 square foot building! 1) Johnny Mango Free Clinic night!